The opening stanza of the timeless hit song “Turn, Turn, Turn” from the 1960’s rock band The Byrds is very appropriate at this time of year. The iconic song gets its origins from Ecclesiastes 3:1 in the Bible. With senior proms, college and high school graduations, retirements and the summer wedding season upon us, there is much to celebrate. We should take the time to celebrate, responsibly that is, as this is a time to reflect on what has been accomplished and to thank those who helped us along the way. 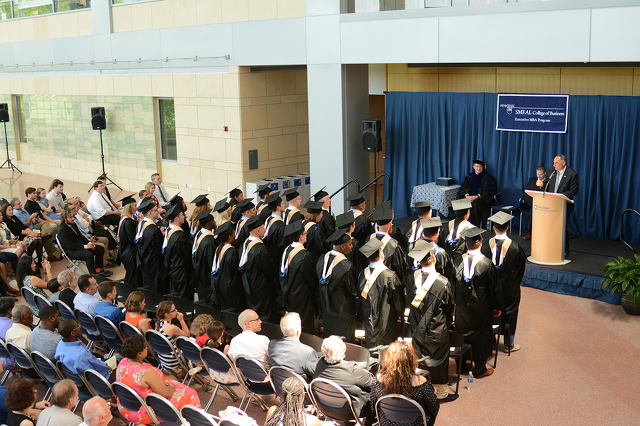 I had the honor of giving the commencement speech to the Smeal College of Business Executive MBA students at their graduation ceremonies on Saturday. It got me to thinking about this word “commencement.” Seems a bit odd that we use the word to both celebrate the conclusion of an achievement, usually associated with the awarding of a degree, but also as the launching point for a next step in life’s journey. 1. a beginning or start. "at the commencement of training"
"the commencement of the festivities"
2. a ceremony in which degrees or diplomas are conferred on graduating students. "a commencement address"
So while it may seem a bit confusing, it really does make sense. Because in reality, we should always be learning, striving to achieve and ready to commence the next step in our careers or personal lives. The setting inside the Business Building atrium on Saturday was perfect for a graduation. The sun was shining through the windows offering a spectacular view for all. The instrumental music of the Curtin Street Chamber Players helped set the right celebratory mood. After opening remarks from Professor Al Vicere, I was introduced to the audience of graduates, faculty, staff, family and friends by Dr. Ivelize Kock-Montesino, a member of the graduating class. I kept my speech short (hard for some to believe! ), but full of passion and energy. First and foremost, I gave my hardy congratulations to the graduates. It is an exceptional accomplishment for these full-time employed candidates to be able to complete this intensive 21-month program that meets every other weekend in Philadelphia. In many cases the students are also married and/or raising a family while finding the time it takes to attend classes and do the homework required to earn the executive MBA diploma. After congratulating the graduates, I asked them to stand and thank their loved ones, colleagues and the Smeal staff who supported them on this journey. Then I put them through a little "affirmation" exercise culminating in a rousing "We are" cheer. My main message to the graduates was to continue to have the confidence, courage and persistence that enabled them to reach this goal. While they may all have different dreams, passions and values, they are now interconnected forever with their classmates and must use this network for the greater good. Many of these graduates will continue with their current companies in expanded roles, some are beginning new adventures on their own, while others will be going on to new companies perhaps even in new locations. "This is the most exciting time in history to be alive. We are more connected to each other around the globe and there is more innovation happening at a faster pace than anytime in the history of the planet." "You have added to your toolbox and developed competencies to give you the CONFIDENCE, COURAGE and PERSISTENCE to reach your potential and to make a difference in this world." "Have the courage to make the tough decisions when they need to be made, even if unpopular." "Of these three, PERSISTENCE matters the most. You WILL face adversity. You WILL have failures. BUT, they are simply temporary setbacks." "What is your passion, your purpose? What matters to you? What is your bumper sticker message?" "Everybody matters on your team. It’s not about you! It’s about your colleagues, teammates, and customers. You cannot do anything great alone." "Seek and give impactful inspiration. Everyone is a coach and everyone needs a coach. Surround yourself with people who will make you better." "Non-stop nurturing. Never stop learning!" After I concluded my remarks it was time for the more formal part of commencement including the commencement walk. It was heartwarming to shake each graduate’s hand and see the genuine sense of accomplishment in their eyes. Keith Unton was the academic valedictorian of the Smeal Executive MBA Class of 2017 and at the start of his talk he brought up a recent article entitled, “Why valedictorians rarely become rich and famous.” The audience chuckled, but Keith was quick to point out that it was in reference to high school valedictorians and not college, and certainly not graduate school valedictorians. The crowd laughed heartily at his clarification. At the post-ceremony reception I met the wife of one of the graduates who was carrying their young child and she said to me with a smile, “Yep, this one’s an EMBA baby!" That really drove home the sacrifices that some of these families made during the 21-month program. A special thanks to Tara Banerjee, Christa Stofferahn, and the Smeal staff for a wonderful job organizing the ceremony. 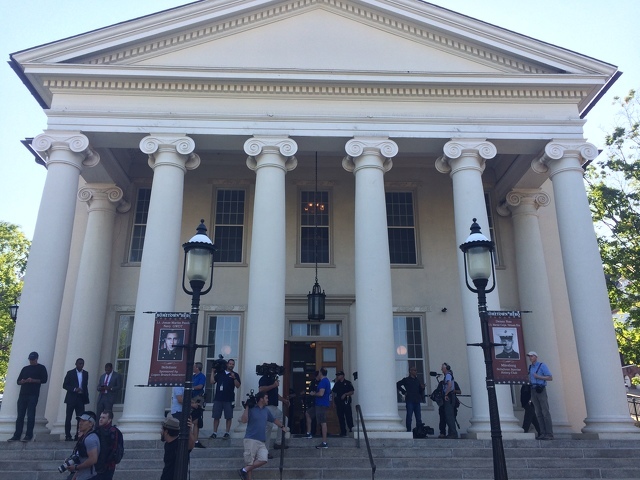 As members and pledges of Beta Theta Pi fraternity at Penn State carried the unconscious body of Timothy Piazza from the basement to the house’s great hall the morning of Feb. 3, the 19-year-old from Lebanon, N.J. was pale and rigid, his fists clenched tight and according to investigators, his breathing labored and his extremities cold.